Trend Alert! For those planning a 2020 wedding, you’ll have lots of options next season if you’re interested in going green. In the coming year it’ll be the perfect time to embrace the colour green, green the lifestyle and greenery as decor for your ceremony and reception. Check out some of our favourite trends for 2020 and let us know what you’re most excited about on one of our social media channels. 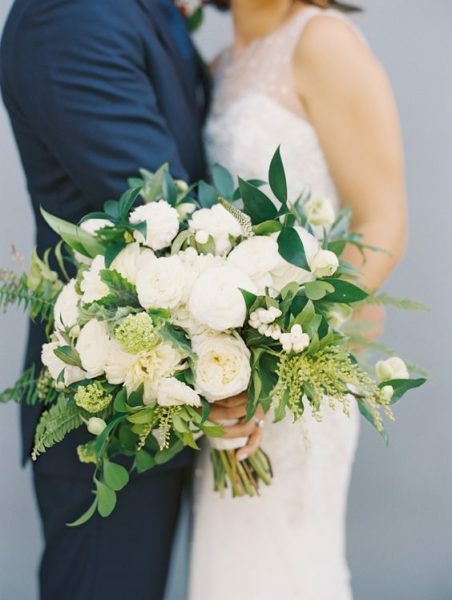 The easiest way to incorporate green into your 2020 wedding is with fresh greenery and flowers. Rather than choosing a colourful bouquet, a simple white arrangement helps the colour green really pop. This simple yet elegant bouquet alternative is on the rise. 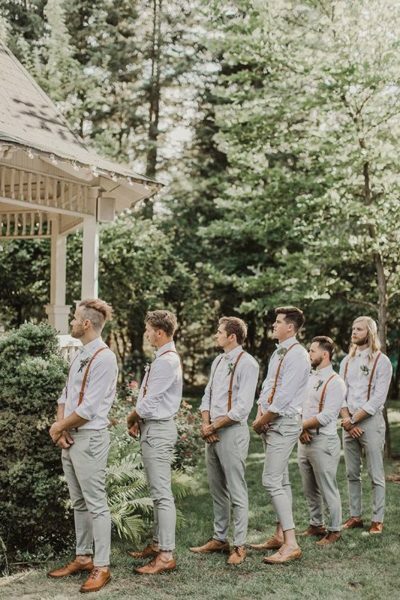 When you look back on your wedding photos in the decades to come, you won’t regret these timeless neutral tones. And white and green flowers aren’t just for the ladies, they work perfectly as boutonnieres. More and more brides are eco-friendly and environmentally conscious, even when it comes to their wedding day. The best way to plan a “green” wedding is to use recycled paper, cut down on plastic or disposable decorations, and make sure your menu features locally sourced food (ideally vegetarian)! More and more vendors are environmentally conscious, so you’ll have no shortage of options to choose from in 2020. 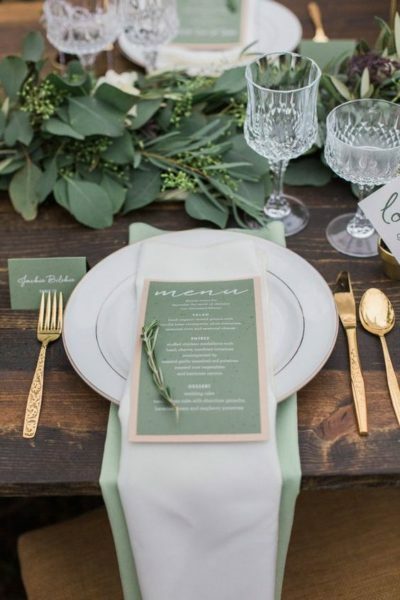 We love a pop of green for an outdoor wedding. The men look dapper in pale khaki green pants and the women look stunning in their pastel green gowns. 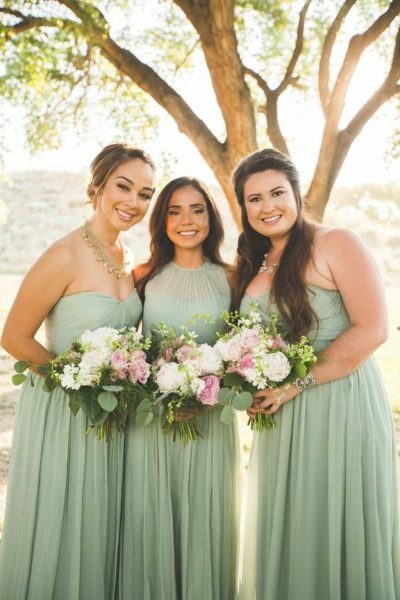 Matching or mismatched, we love green for the wedding party in the coming season. 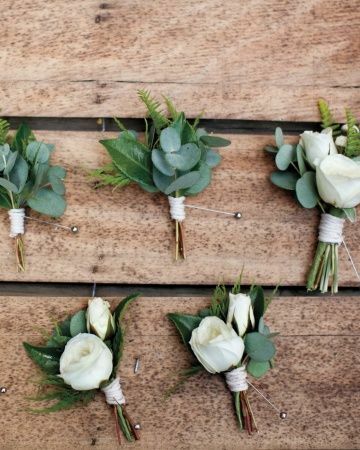 Last but not least, you can add touches of green just about anywhere you want during your ceremony and wedding reception. 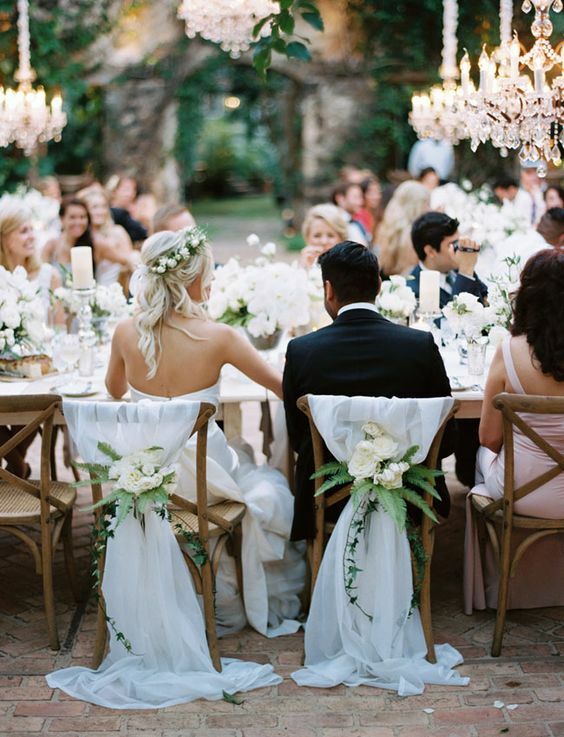 We especially love greenery that covers the chairs and tables during dinner. 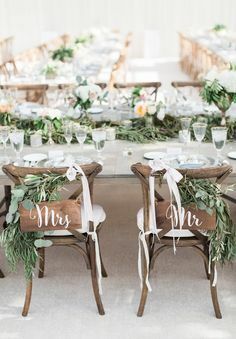 Along with wooden chairs and tables (rather than the traditional slip-covered seats), you’ll have the perfect green themed look.